Registration: Registration is closed. For info on future workshops, sign up for our e-list. 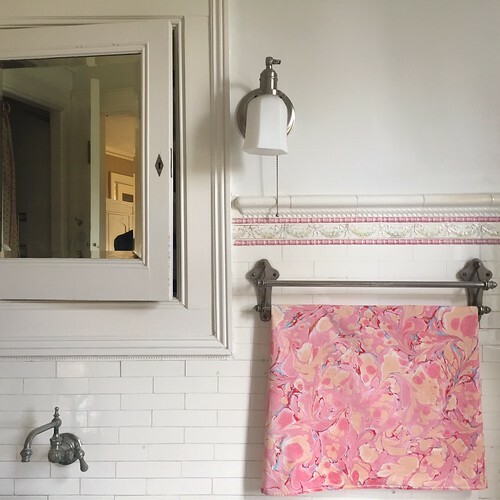 Learn the art of marbling on fabric. Marbling is an ancient and satisfying craft that invites you to cede control and embrace chance, forging a loop of continuous learning. Paint is floated on water, creating an organic design, and then the pattern is picked up by gently laying fabric on top. Like a monoprint, it is about creating one-of-a-kind pieces, full of color and movement. In this class you will begin by marbling scrap pieces of fabric to learn the feel and movements of paint floating on water. Once you feel comfortable with the process, you will create a set of three unique tea towels—a gift for yourself or another.